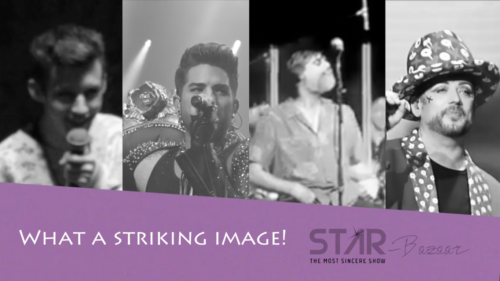 Vote Adam Lambert @ 2017 STARBAZAAR.TV SPRING AWARDS: WHAT A STRIKING IMAGE! 2017 STARBAZAAR.TV Spring Awards is an unique online discovery. The new special category every week. Stay with us and watch for updates! Support your favorite artist! The second category is a battle of talented and… shocking singers. The battle of their images! 2017 STARBAZAAR.TV SPRING AWARDS: WHAT A STRIKING IMAGE! Isn't this poll over? Adam apparently won BIG TIME. I couldn't see how to vote anyway. what a waste of time. According to the site ADAM was/is the winner of this poll with a 'whopping'? seven votes?? When was it held?? Why are we just now hearing about it?? I'm confused ... yet again!! Tess, which is your category ...lwl! “He who knows not and knows not he knows not: he is a fool - shun him. He who knows not and knows he knows not: he is simple - teach him. He who knows and knows not he knows: he is asleep - wake him. Lambert Outlaw....you're breaking me up!.... that next to last message from you sounds exactly the way I am feeling... most of the time!!!!.... "I'm confused...yet again!!" SO FUNNY!! Lam-My ... I would like to think the 4th one is mine .. however with one change ... do not follow me!! I like to keep my wisdom to myself ... I think each of us has his own wisdom to share if/when it is asked for. I wouldn't want anyone to blindly follow me just because I seem to know all the answers. You may also have your own wisdom to offer ... I believe in sharing what we know for the betterment of all!! Does that make sense?? I've never been nor ever wanted to be a leader nor a follower ... I just march to my own drummer & do as I feel is right for me & those I care for & love!! However that doesn't stop me from admiring those who dare!! lollymop ... Go to the link on Ytube I've posted above Lam-My's post!! I found that at the end of the video on the link here on 24/7 .. thumbnail vid ... so I followed it & found this promo ... looks like some TV show in the UK?? not sure where but that's the impression I got!! I think it's a weekly poll for different catagories .. my thoughts .. not sure if I'm right!! You go there & see what you think .. OK?? Tess...okay, agree to your aspired category lwl! Not so easy to be a leader because a leader first of all must be a 100% giver, of her/his whole self. That's the most difficult part of being a leader. And without saying, a leader must have the capacity in terms of knowledge, know-how, thinking, wisdom and acceptance of others regardless their kind. And 'dare' as pointed out by you...though got be careful here as it can cause a make or a break. I think leaders are born; it's a special gift; coupled with circumstances to sieve it out and wise parents to nurture it from young. "It turns out that the brains of effective leaders exhibit similar electrical patterns....generate high levels of coherence in the right frontal part of the brain, which is responsible for interpersonal communication and social relationships. It may even be possible to teach this part of your brain to operate more effectively." Lambert Outlaw...hahahaha....you're getting funnier all the time! Sound like my clone! That "password" part really hit home.. forgot password get new one.. forgot ID...get new one, etc. Lambert Outlaw....Just a few "sage" words of advice from your "Elder"....Keep your sense of humor finely honed...use it every chance you get.... and say what you truly think and feel, as long as it does not hurt anyone. And..... try to make others laugh whenever possible! Look at it this way, some of our travails with technology would make good stand-up comedy.......or sit-down-comedy, if you'd rather. Lambert Outlaw....Then, what better place to hang out in than 24/7 for us? Adam is the catalyst -- I feel so lucky to be his fan--- first time I was ever anybody's fan (except a bit for Gene Kelly in my teens) --- and my family think I'm nuts...and probably unseemly...at my age. I would think so too, if I hadn't discovered Glamberts and 24/7....turns out there's a lot of "unseemly nuts" out here....among the more age-appropriate "seemlys". And we can talk about Adam however we want to without being "judged". Enjoyed the chat, it's nice to talk to people who understand where you're coming from., isn't it? I love how we feel like old buddies here. It's been quite a while since Adam has brought us together. He's really broadened our horizons. I don't know what I'd do without my Adam family. It would leave a hole in my heart. Attention all voting Glamberts!! Just came from the link on here & I actually got to Vote this time so apparently the poll is still ongoing .. ADAM is still leading .. he now has 11 votes?? Let's do better than that for our Glam boy .. vote as often as it will allow!! Keep checking back as it doesn't say how often we are allowed to vote ... don't you just love these kinds of polls?? I'm on my way back over now ... please join me ... just click on the link here on this article!! Let's show ADAM our support whether it's important or not!! Lambert Outlaw...looks like we both keep weird hours. I was just going to bed about 5:30 am EST... I think you must be on EST, too. Just visited/voted at the above site.... Adam has 27 votes now. I refreshed the site and voted again several times, but the vote never increased past 27. With no instructions, there's no way to know if I am limited to one vote ...per poll...per day... or if it's over, Adam won, time to move on! Like you, I hate these polls! All those websites seem to be interested in is getting as many "hits" as they can. A "decent" poll would tell us rules and time limits to respond to. It has to be completely fouled up, because we all know that Adam HAD to have received lots more than 27 votes from just our group. How could he be so far ahead with only 27 votes? Gosh, is it possible that it is not really a legitimate site, but a "phishing" or "scam" site, or whatever. After having my computer "high-jacked" close to two years ago, and held for ransom, which I refused to pay-- I lost EVERYTHING on it -- and still had to pay a fortune getting it repaired by experts so that I could start FROM SCRATCH again. I still have NO idea how/where those crooks got into my computer. Imagine what it's like to lose all your photos, Names and addresses, phone numbers, email addresses, birthdays, personal information on friends and relatives, anniversaries, doctors contacts, record of medical tests, innoculations, doctor's information, Bank and brokerage info, etc. etc.!!!! Everything!!! I'm really "gun-shy" now -- especially since I don't know HOW/WHERE/WHY it happened. And my outside contracted/paid Security system was helpless against it! Sorry, didn't mean to bore you with my problems. But if my describing it saves anyone else for having that happen, at least that's something good. I wish I could tell you how to avoid it! I always told my grandkids--when their school was closed -- about how I walked ten miles to and from school everyday in waist-deep snow, and sub-zero temperatures.... ALL UPHILL!!! Just chiming in to say how much you all are appreciated. I enjoy the stories and especially the comraderie here even though I don't post much anymore due to the negativity that rears its ugly head now and then but I do check the posts regularly. I am very worried about our country so Adam and my fellow Glamberts are always a very welcome escape. Nanbert that's horrible about your computer! (I just knocked on wood). It's a reminder to really be careful what we click on. Hugs to you all from what was a flooded Northern California about 2 weeks ago to what is now about 80 degrees outside. Stay safe there in the East USA. Hi daydreaming... thanks for your sympathy. And you're quite right, I/we have to "really be careful what we click on" -- I suspect I got caught by some sensational or startling claim or story that caught my curiousity while surfing the net. I hope you didn't get personally flooded two weeks ago...how awful that must have been! That, following on such drought conditions that so much of California experienced should make people think seriously about climate change. Stuff like that is happening all over the place. We recently had a "heat wave" here in W. Pa. for a couple of days that triggered lots of buds to start sprouting....then temps went quickly back to the mid-teens...and has probably killed them all. Weird! Stay on and enjoy the Adam news and lively commenting! Hi Sister Glamberts ... it's me again ... hubby went to bed so here I am getting in touch with my Glamily! Snow was worse in other parts of NY ... we got about 6 in. which is way less than other parts of Western NY ... schools were closed .. plows were out .. did a great job this time .. actually were prepared & got ahead of the plowing for once!! Nanbert .. what part of Western PA are you in? Hubby is NY born Pittsburgh PA raised ... then he came back here & found ME!! I always say he didn't just marry me .. he rescued me from a very bad first marriage .. back then they had no shelters for me & my young son ... my Mom GOD rest her angelic soul took us in & cared for us until I could start feeling good about myself again!! Dad was gone .. we lost him when I was 16 y.o. I could write a book!! Someday I'll tell you all about my turbulent life .. not now ... very long story!! Sorry about the computer nightmare you went through ... had my debit card hacked once but my bank caught it & froze my account until they could fix it .. fortunately it was just a few dollars ... Rockefeller I aint!! Hi daydreaming ... good to hear from you .. thanx for all the wonderful videos you upload of ADAM's tours on Ytube!! Clear & beautiful close ups ... how do you keep so steady?? I'd be shaking so bad I'd ruin the picture!! Here's a little example of my photography *expertise*. One day long ago when my children were sitting on the couch watching TV "quietly" I got the notion to take a picture of my 'angels' .. so I got hubby's camera (he's the photographer) and snapped the picture w/out disturbing them. Back then you needed to have the film developed so I took it to the store .. anxiously waiting for a few days to see the picture when it was ready .. I sent hubby to the store to pick up the package for me w/out saying anything about my first try at photography!! Well ... when he opened the envelope & started flipping thru the pics he said .. 'What's this? I don't remember taking this'!! Full of pride I told him I had taken the picture ... you can imagine my dismay when he showed me a picture of the TOPS of four heads & the living room curtains!! That did it ... from now on when anyone .. anyone says 'would you take a picture of this/us/it' ... no way will I ever try again!! I leave it to the pros who KNOW what they're doing!! Good job Glamberts!! We're up to 75 votes & still going strong!! Hahaha.. Lambert Outlaw... we are even more alike than I thought. Your photography fiasco could have been my story.... we're just technologically disadvantaged! I even had my credit card "hacked", but Visa caught it in time, stopped payment, and issued a new card to me. I was impressed with their vigilance. BTW, I'm from Pittsburgh...since 1973. Growing up, my family moved several times, and after I married we also moved often...a lot overseas, Belgium, Libya, Puerto Rico. This is the longest I've lived anywhere. We've also both had bad marriages...your first...my first and last! I could write a book about that, too. I almost lost my life trying to get out of mine! I was 48 at the time, and felt lucky to still be alive and finally free! But all that's a long story...another time, maybe. I try not to dwell on it. Carpe diem (seize the day), Tess! Oh Nanbert ... we really are Sister Glamberts .. aren't we? Except I've never been outside of USA .. only a few trips to Canada for gas a long time ago when theirs was cheaper than ours .. now it doesn't really matter .. we don't go Sunday driving anymore ... hubby says there are too many speeders on the road .. could be he's slowed down quite a bit .. so much so that one time two older women passed us out & one of them 'flipped him the bird'!! I laughed so hard I almost wet myself!! He used to race motorcycles until he broke his leg & I made him quit or I'd break the other one to make sure he did .. jk ... I wouldn't ever lay a hand on his silver head .. he's a saint .. next week we'll be celebrating our big 50th wedding anniversary ... poor dear .. I don't know how he's put up with me that long ... longer even .. we met in 1962 & we've been together ever since!! He's a SAINT!! Hey!! My hubby's family are scattered all over Pittsburgh .. Murrysville .. Zelienople? .. he lived in West View growing up as well as other places .. he could tell you better than I can!! I'll tell him you're fellow Pgh-ers .. he'll get a kick out of that!! Lambert Outlaw...I'm laughing out loud....been there, done that!!!!! Hahahahahahahahaha!! OMG, I wish we lived closer to each other. By the time you get to my age, all my friends are either...retired and moved away...dead...living in a nursing home.... addled...or too sick to "play". My sister is my best friend/nut, but she lives in New Jersey. We talk every day, and get in some laughs together, but other than that it gets a little lonely. But, I just come here to 24/7 to get caught up with news of Adam and chat with other Glamberts ... his amazing talent and showmanship has attracted us all like moths to a flame! It is presently 4:45 am EST...and I am, stupidly, still up! Nite, all. Nanbert .. When I was younger I used to hang with younger kids than myself. The ones my age always made me feel unwanted so I felt more comfortable with the ones a year or two younger than I. Well ... honey ... I'm still here & most of them have either moved away or passed on .. some I simply lost touch with!! My best friend was Mom .. although we never did much together. We became closer when she gave up her home & moved in with my oldest boy!! Then I moved back here .. the home I've always known since I was 5 until I got my own home .. in between there were some real raunchy places but when I met hubby we lived better .. told you he rescued me! !She didn't want any strangers living in her house so we packed up & moved here .. all the kids were on their own.. it was getting harder to climb stairs & Mom's house was one story .. just what we needed .. so here we are for good .. I hope ... no nursing homes for me .. ugh!! Snow's not letting up much here .. how about Pgh .. did you get dumped on as much as Philly?? Saw reports on the weather channel & they really got a lot of snow there. Here it's light but constant .. no let-up which is unusual for Buffalo .. we usually get the lake-effect snow. Crazy March weather .. can't wait for spring so I can open my windows & get some fresh air!! It'll be nice to see the trees & grass turn green again!! I've had enough of winter already & spring is just around the corner .. oh happy day!! I was at the voting site awhile ago & the poll is still ongoing ... voted again & now ADAM is so far ahead no one can catch up even though he always was!! Lambert Outlaw...YOU talk about clueless!... I'm still trying to figure out what TTYL means at the end of your last comment! I'm just not onto all these new-fangled "texting" shortcuts! I never know if I'm being insulted, complimented, advised, dismissed, or well-wished. Is there a dictionary for them? It drives me crazy when Glamberts refer to songs by Adam by their initials...and I find myself frantically trying to line them up with the songs' names! And the more new songs he sings, the more difficult it becomes! I just learned LOL recently...and was advised to use it frequently in order not to have my off-beat sense of humor misunderstood. I use it when I remember, but hate it, because I would NEVER say "laughing out loud" in a conversation to clarify my remarks. That's what faces are for! So...I'm stuck with faceless conversations that use completely new vocabularies....and I'm usually clueless!....LOL! Thank goodness, when things get too frustrating and confusing, I rush to Youtube and sooth myself with wonderful Adam videos! What would I do without him?!!! What DID I do BEFORE him?!!! Oh my! P.S. In answer to your snow question... we only got a couple of inches here in Pittsburgh. The person above keeps rattling on and on and yet when I say something she is not "attuned" to, she jumps at me, and recently even supports a ban on me from this site and said she was "ashamed of my comments" on a recent thread. What the hell! What is happening is, I am supposed to tolerate her rigmaroles and she clamps me down when she is not even conversant on the matters I comment on and as a result causes unnecessary brickbats. Usually, I'm very tolerant about what people want to vent out or say but I detest to my stomach when the person above keeps trying to shut me up and there she goes non-stop! That's hypocritical double standard! If she wants to write rigmaroles, go ahead, I've nothing against that; just don't impose on me to have to tolerate it when she doesn't offer me the same treatment. Just scroll past things that bore you --- that's what I do. Well, one of the pseudos will give the cliche advice: Scroll... Yes I do that when I see those pseudo rigmaroles by pseudo commentors. But when I have commented on a thread like on this one, I come back to check if there is any message for me because I always reply unless there's a reason not to. By the way, I do have some rather pleasant, broadminded friends/fans on this site. I came back a few times and there she's at it again rigmarolling through the snow. As I said, I don't actually mind but it's the double-standard hyprocrisy I'm hitting out against! The person above the above, can carry on and on whilst she stumps/clamps down my substantiated reasonable comments? No double-standard for me, please! not my way of life/culture. You see, I didn't read her reply before I posted my above comment; sure enough...can practically read her cliche mundane mind, always three steps behind. Perhaps the best solution for further brickbats is your wonderful solution! which you can't keep. Goodbye, Lammy... I'm sorry I "bothered" you. Let there be peace and QUIET between us now. I have nothing more to say to you or about you. Pretend I don't exist, and I will do the same for you. I am here for Adam. Pax Vobiscum!" "(August 26, 2016 at 1:58 AM)"
By the way, there's nothing boring about stating the above reminder (7th time) because anything functional is never boring because it serves its purpose. I shall continue reminding you when required. Lammy, the fact that you suddenly jumped on me here without any previous contact or provocation on this thread, while I was simply having a fun chat with other Glamberts is uncalled for. It's obvious you don't like me, but you're beginning to look like a stalker. From your remarks, it's clear that you are angry because I refused to acknowledge/discuss your theory about whose inaugural crowd was larger--Trump's or Obama's on another thread -- it was old news, I was not interested, and I find contact with you unproductive and unpleasant.....amply proven by your unprovoked attacks above! And yes, I did agree with a couple other Glamberts' suggestions that you should be banned from this site after you subjected Glitzylady to the most offensive, insulting, vilifying assault imaginable. Later, you crept back to that location and deleted all your vile remarks--hoping to obliterate all traces of your "crime". When I saw that, I left you a message sayying you must have been ashamed of your remarks, so you removed them, but that the "odor" still remained, and the only way to erase it was to apologize to Glitzylady. You never did. For the record, I have little doubt that you will delete your comments above, as you have done at other times when you have attacked and insulted me. Your style seems to be "Hit and Run" --- remove the evidence. But nevermind, like you can re-play my quotes (above), I can re-play yours if I choose. I've learned to photocopy your attacks before you delete them. Last, but not least, it's also obvious that you were jealous that I was having fun chats with "friends" of yours---that I was "rattling on and on" ( that's the pot calling the kettle black!). If I'm not mistaken, we are all Glamberts...all friends... on an Adam Lambert fan site. So, Lam-My -- LEAVE ME ALONE. Do not attack me again. Do not feel that you can say whatever you wish about me, then delete your remarks and run away after I respond. You never cease to be 3 steps behind all the time! I do not delete my comments because I want to run away from what I state very clearly! That's not me at all ! Even when I deleted myself from that group attack thread where you supported my ban! from this site, I didn't actually leave ! I went on and wrote out my grievance just a couple of threads below it, in a stringent poem...proving I was still present and the words used in that poem were just as strong, against 3 pseudos, you were one of them. If I had actually run away, I would not have continued fighting/writing. Do you really want to know the real reason why I deleted myself; well, if you are observant enough, which you are not, with head buried in the sand and brain too; I only do that to one person/opportunist you mentioned above. Go check it out ! Your allegation of my hit and run because I want to evade, is baseless and shows the pretty murky, mushy brain of yours...lashes out without finding out first. Not even once did I delete myself because I want to hit and run! Get that through your thick skull! And neither do I need to do it now because I only delete myself from that person! I don't want to be associated with her on the same thread. I deleted myself even when I was not in a quarrelsome situation; like when I wrote poems and stories; I do not want my writings to fall on the same thread with her. So for the time being, I will be here, contrary to your way-off prediction that I will delete myself again. Hey Madam moong-cha-cha, Wake up! The reason I had to lash out on you is not because I'm jealous you speak with my friends! sounds so strange! It's because you keep clamping/shutting me up even when my comments were substantiated and reasonable; and yet you went on a rigmarole binge...that is hypocritical. You can't control people like that, you know! With regard your copying that thread comments, I saved them and will gladly reproduce them, nothing to be ashamed of, with beautiful haiku too! In reality I was defending myself against your call for my ban...with haiku! Can you beat that? *8th reminder as you said...pretend we don't exist on this site regarding us, so just keep away from me and I will gladly oblige and grant you the same! Step 1: I will not step into threads where you are already present and you please do the same! Keep your word this time! Lam-My.....I go where I wish...this is a website for Glamberts, not for Lam-My. Go wherever you wish, you have that right as much as I do. Just LEAVE ME ALONE! I know you thrive on insults and chaos.......I do not care to play your childish game...... Nor will I allow you to bully me at will. Actually, I've always left you alone; you don't have to keep stressing it to try to pull wool over people's eyes like you have been victimised by me. The fact of the matter is you tried to boss me around to silence me from giving my opinions. For instance, you said I was a Foreign National and should not meddle in your country's affairs regarding the Elections. I have news for you...I ain't no Foreign National! A foreign national is one who stays/works in your country. I am a born, bred, cultured Singaporean all my life not your foreign national! please! And in any case I was not meddling in your country's affairs. I was just laying down some observations regarding the Elections. Does one need to be a citizen to critique world affairs. This is Internet, a worldwide forum. And then the latest calling for a ban on me! What the hell ! And so I thought I finally had to put you in your place and you offered the opportunity on a silver platter by your incessant rigmaroles. If you can boss me around to shut me up, hey, I can do the same to your comments; fair and square! So stop trying to paint a different picture like telling me to leave you alone, I've always steered clear of you. Don't try to turn the tables and weep like a victim! The truth of the matter is you tried to bully but failed miserably! Wakey wakey time is running out!